If you were planning on knitting everyone you love a beanie this holiday season but didn't ever get around to doing the actual knitting, this is the project for you! If you are obsessed with velvet this fall and want to wear it head to toe, this is also the project for you. If you don't have a lot of time or money, this gift can be whipped up in a jiff with a minimal amount of materials. 1/3 yard stretch velvet. You could use any type of stretch fabric, but its going to look best in something that has some body (AKA not a jersey). It would look great in a fleece, sweater knit, velour, sherpa, etc. This beanie pattern. You can download it here. 5/8" seam allowance included in pattern. Use a zig zag or stretch stitch, except when sewing the darts and attaching the optional patch. 1. Print out the beanie pattern (you can download it here). 3. Mark darts at the top of beanie pieces on the wrong side of your fabric. 4. Matching dart legs, stitch down to dart point. Tie off your thread so your dart doesn't open up. Repeat on other beanie piece. 5. Right sides together, using a narrow zig-zag or stretch stitch, stitch all the way around the beanie pieces (leaving the bottom open). 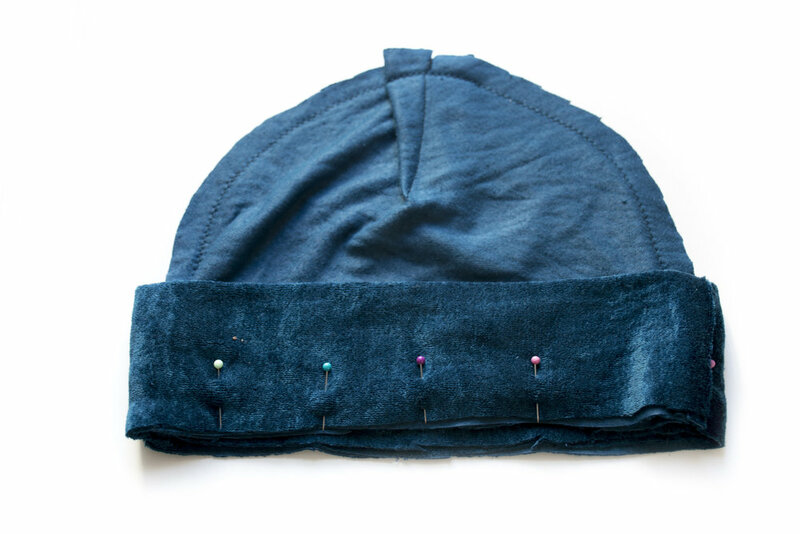 OPTIONAL: If you want to sew a little patch onto your beanie cuff, press edges of fabric scrap under and pin it to where you want it placed on the cuff. Keep in mind the seam allowances (5/8") and the fact that the cuff will be folded in half. Stitch that cutie into place! 6. Place your cuff pieces right sides together and stitch down both sides. 7. Fold your cuff in half and pin the right side of your cuff to the wrong side of your beanie. Stitch all the way around. 8. Trim away excess seam allowance, AND THAT'S IT! 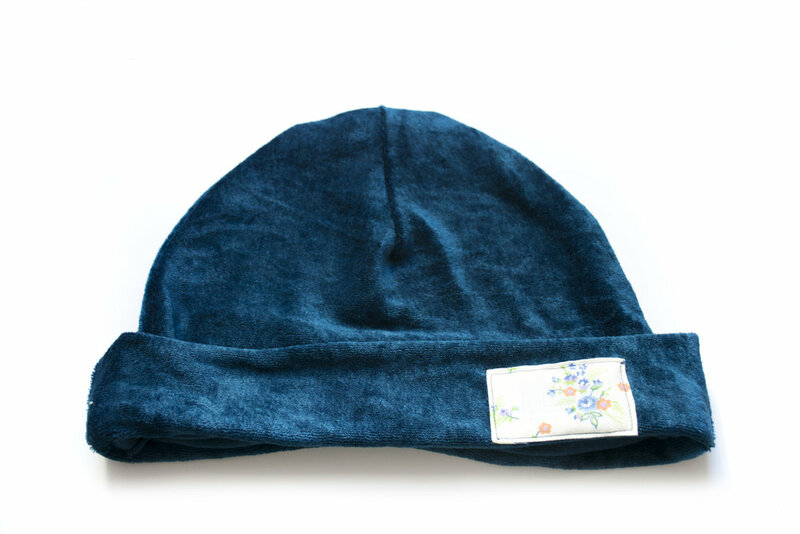 This is a pretty standard size beanie and fits a medium (to slightly large) sized head.